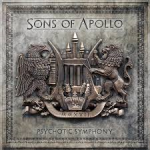 Share the post "Album review: SONS OF APOLLO – Psychotic Symphony"
Sons Of Apollo only formed earlier this year and come labelled with the ‘supergroup’ tag, which can be a blessing or a curse – luckily a blessing in Sons Of Apollo case. The Sons Of Apollo are Mike Portnoy, his fellow ex-Dream Theater band mate Derek Sherinian, Billy Sheehan (who Portnoy worked with in the Winery Dogs), Jeff Scott Soto and Ron “Bumblefoot” Thal (ex-Guns ‘N’ Roses). The album is a musical monster that’s for sure, as the collective members input their various influences from past and present bands, plus their love of bands like Deep Purple and Rush. Everything on this album is big in sound and nature, as the opener ‘God Of The Sun’ clocks in at over ten minutes. On this we have those groove filled bass lines from Billy Sheenan, stylish solos from Ron Thal, Derek Sherinian creating all manner of sounds from his keys and Mike Portnoy driving it all along with his relentless drumming. Jeff Scott Soto is a perfect foil for these four as he has the power and melody to match the music. ‘Labyrinth’ features a Jon Lord-esque Hammond from Sherinian (also on the intro to ‘Divine Addiction’), another massive tune with plenty going on musically to satisfy prog fans, yet enough melody to appeal to any lover of rock music. ‘Divine Addiction’ really digs that Deep Purple sound circa that band’s ‘Perfect Strangers’ album. Even the guitar solo sounds like Ritchie Blackmore! ‘Coming Home’ has an instant melodic rock appeal a wise choice as the single lifted from the album. Not unlike Soto’s solo work in sound. The instrumental ‘Opus Maximus’ does what it says on the tin, cramming in lots of musical highlights into ten minutes. The guitar playing of Thal has a metal edge on this one, whilst Portnoy fair blasts his drums out of the studio with the power of his playing. This entry was posted in ALBUM REVIEWS, ALBUM REVIEWS (Mobile), All Posts, PURE METAL (All posts), Pure Metal/Album reviews, The Best of 2017 and tagged album, Billy Sheehan, Derek Sherinian, Dream Theater, Jeff Scott Soto, metal, Mike Portnoy, progressive, Psychotic Symphony, review, rock, Ron Bumblefoot Thal, Sons Of Apollo. Bookmark the permalink.